Shopping cart abandonment — when shoppers put items in their online shopping carts, but then leave before completing the purchase — is the bane of the online retail industry. But it’s also a huge opportunity: Approximately $US4 trillion worth of merchandise will be abandoned in online shopping carts this year, and about 63% of that is potentially recoverable by savvy online retailers, according to BI Intelligence estimates. In a new report, BI Intelligence explains what leads a shopper to abandon an online purchase and how retailers can begin to combat rising shopping cart abandonment rates. We collected and analysed data from top e-commerce companies, and spoke with industry experts whose job it is to reduce abandonment rates and boost conversions, to come up with a number of solutions that can help retailers recover lost sales. Approximately $US4 trillion worth of merchandise will be abandoned in online shopping carts this year, and about 63% of that is potentially recoverable by savvy online retailers, according to BI Intelligence estimates. Shopping cart abandonment is increasing, and it will continue to do so as more consumers shift to online and mobile shopping. 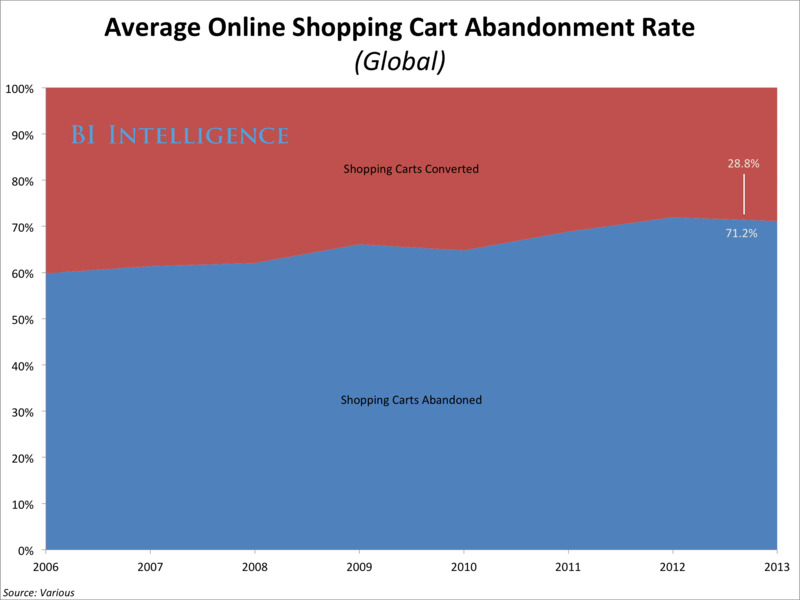 In 2013, as many as 74% of online shopping carts were abandoned by shoppers, according to data shared with BI Intelligence by e-commerce data company, Barilliance. That abandonment rate is up from 72% in 2012, and 69% in 2011. An abandoned shopping cart does not automatically translate to a “lost sale,” because three-fourths of shoppers who have abandoned shopping carts say they plan to return to the retailer’s website or store to make a purchase, according to data from SeeWhy. Online-only retailers are at a disadvantage to “omnichannel” retailers in this respect because they have fewer channels through which to recover lost sales. Retailers can reduce the rate of abandonment and increase conversions by streamlining the checkout process and also by retargeting shoppers with emails after they have left a website. Initial emails, sent three hours after a consumer abandons a cart, average a 40% open rate and a 20% click-through rate, according to Listrak. More broadly, an abandoned shopping cart should be seen as part of the increasingly complex series of steps a consumer might take before finally making a purchase and a strong indicator of consumer interest in a product or a brand. Technology that helps retailers collect and leverage online shopping cart data is likely to be a worthwhile investment. Explains the complex relationship between consumers and retailers and outlines reasons why shoppers abandon a purchase. Includes interviews with executives from top retailers and marketing agencies who talk about what they are doing to reduce shopping cart abandonment. Proposes a list of solutions that are proven to reduce shopping cart abandonment for online retailers. Forecasts where this trend is going and how shopping cart abandonment will affect retailers — bricks-and-mortars and e-commerce companies alike — in the future. For full access to all BI Intelligence’s charts and analysis on the e-commerce industry — including downloadable Excel files — sign up for a free trial.